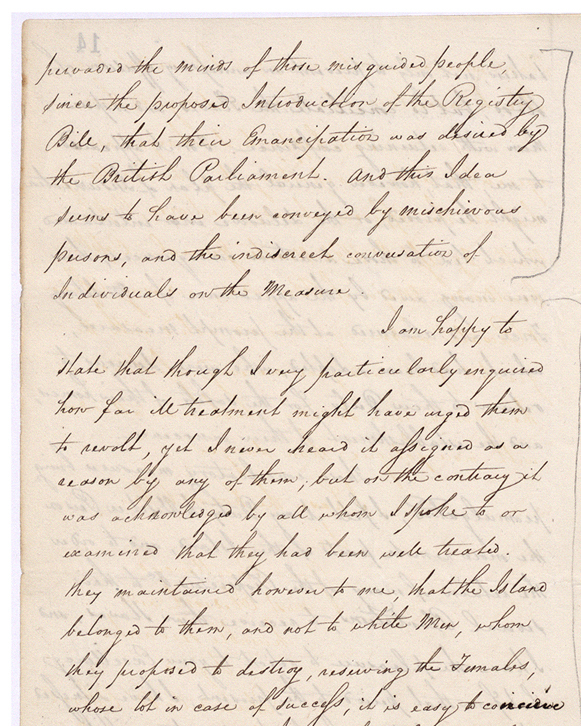 Letter from Colonel Edward Codd to James Leith, his report of the insurrection, 25 April 1816. …pervaded the minds of those misguided people since the proposed introduction of the Registry Bill, that their emancipation was desired by the British Parliament, and this idea seems to have conveyed by mischievous persons, and the indiscreet conversations of individuals on the measure. I am happy to state that though I very particularly enquired how far ill treatment might have urged them to revolt, yet I never heard it assigned as a reason by any of them, but on the contrary it was acknowledged whom I spoke to or examined that they had been well treated. They maintained however to me, that the island belonged to them and not to white men, whom they proposed to destroy, reserving the females, whose lot in case of success is very easy to conceive.